If you are new to the industry, there are some important financial details you should know. First thing is to find a good tax accountant who is familiar with the entertainment industry. There are some quirks to the business that some regular tax guys don't fully understand. The author is not a tax accountant, these are just some helpful guidelines to prepare your financial situation for your tax guy if you are unfamiliar with the industry. Talk to your coworkers about taxes and budgeting. They might know a good tax guy to recommend or they might know about some quirks in the tax rules that are specific to your area or some new regulation that this general guide doesn't cover. Next, download the Freelancer's Tax Worksheet. This is a Microsoft Excel spreadsheet that will help you to keep track of things for your tax guy. You may end up making some modifications based on your specific location and your tax guy's recommendations. There are also some new independent contractor apps available for smartphones. From the "What You Should Know On Your First Gig" article, you should already be writing the details of your gigs down. Keep a paper calender of your schedule. If you use an online or computerized calendar, keep a paper calendar anyway as a backup. If you don't use a computerized calendar, keep 2 paper calendars, just in case, at least one small enough to carry around with you. This is where you write down all your future gigs that you are scheduled for and where you should be keeping the details of each gig, as explained in the article. On the Freelancer's Tax Worksheet, keep track of your time after you have completed your gig. Record your time in and time out, how many hours you worked (these may be different numbers if you completed a strike in less than your required 4-hour mini or you are on a day rate and your clocked-out time is less than your 10 hour-day, so it's important to record both time and hours. ), your rate, the dollar amount before taxes that you expect to receive, the name and location of the show and - this is very important - how many miles from the local office of the company who hired you to the location. You can Google Map it at any time to make it easy on you. If you have any days where your rate changes partway through it (if you go into overtime, for instance), write the rate change on its own row. So, if you worked on Monday from 8 AM to 8 PM with a 1 hour lunch break and you went into overtime at 5 PM, then one line will read Monday, in at 8, out at 5 for a total of 8 hours at your regular rate. The next line will say Monday, in at 5 and out at 8 for 3 hours at your overtime rate. Do not type in the miles a second time if you have several rows for only one trip. When you receive a paycheck, double check your checkstub with your hours against your own records to make sure it's correct. 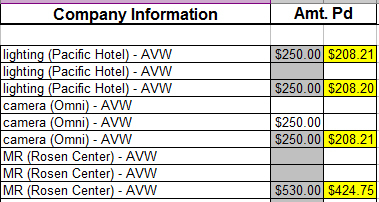 If it is correct (adjusted for taxes if the gig was a W2 gig), enter the amount you received in the column next to your expected amount and highlight those rows of times and dates that correspond with that check. This is a quick at-a-glance way to keep track of who has paid you and who still owes you. As you enter your paychecks, keep an eye on any gigs that were more than 2 weeks back or the scheduled pay period for that gig. If your checks are late, make sure you call that company and keep calling to find out where your paycheck is. Make note of all phone conversations and keep any email or other correspondence with all companies who have not paid on time in case you need to take legal action. Do not let your paychecks go unclaimed for very long, but sometimes there will be delays. Use this form to help keep track of those paychecks that are delayed. Next is to get some large manilla envelopes to keep receipts in. You should be saving receipts for everything. Every time you eat at restaurants or cafeterias while at work, request the receipt. All clothing purchased specifically for work - save the receipt. You should save receipts for food, clothing, your phone bill, maintenance on your vehicle, tolls and parking expenses, any and all computer-related purchases (including internet) if you use your computer for work, and any tools you use at work. Save reciepts for any events you attend that are in the same field as your work. For instance, if you get film gigs, save movie stubs and if you work concerts, save concert ticket stubs - they count as "educational expenses" and might even count as networking the way business lunches count in other industries. Label manilla envelopes to match the type of receipt and the year and store your receipts in your envelopes in a safe place until tax time. You can record your receipts as you get them or all at the end before you do your taxes. If you scroll to the right on your Worksheet, there are some headings to help you get organized. Simply enter the amount of each receipt into its own cell below the appropriate heading, then add them all up at the bottom of the column. This way, when you take all your papers to your tax guy at the end of the year, it's already organized for him, and if you ever get audited, you will have everything the IRS needs for the audit. Keep your files for 7 years, preferably in a fireproof safe with all your other important documents. Bring your envelopes with receipts & checkstubs, your W2s and 1099s, and a printout of this Worksheet with all your gigs and your itemized, added-up receipt totals to your tax guy as soon as you have received your last W2 or 1099 form in the mail. Do not wait until the last minute. Some people file for extensions immediately, whether they think they need the extra time or not, just to allow some wiggle room in case there are any difficulties in obtaining your various forms from your various clients. Now, to anticipate tax time, you need to have a good budget for the year. Freelancing is not steady work and we are subject to "on" and "off" seasons, which will vary from location to location. Especially if you are new, you may not get steady enough work to cover all your expenses. So it's very important to learn to budget. To start your budget, look at all your expenses from last month. Add up your rent, utilities, any credit card or loan payments, your vehicle insurance, how much money you spent on gas and food, and all other money you spent on miscellaneous things. Then take that dollar amount and add 10% to it. 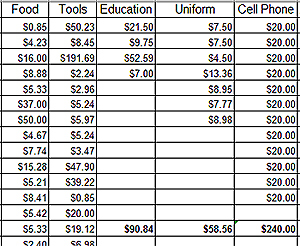 This is the very minimum amount of money you need to survive with your current expenses. If you happen to make any money over your estimated budget (the total dollar amount you spent last month plus 10%), do not spend it. Take that money and put it into a separate account, preferably a savings account that earns you interest. When tax time comes around, if you end up owing taxes, you can use this money to pay your taxes with. If you accounted for miscellaneous spending and you have added 10% on top of that, you should have plenty of extra cash each month for entertainment without missing bill payments. If you want to save up for something extra, you can take it out of your entertainment budget. If you are interested in more aggressive budgeting or learning how to make your money work for you, consult with your new tax guy or look into a financial planner. These are just some very basic tips to keep you afloat with a non-steady income stream. There are many other resources from licenced financial planners to help you improve and build upon these basic strategies. You may find your situation would benefit from incorporating yourself instead of filing as an independent contractor, for instance. If your tax guy really is familiar with unusual independent contractor situations, he can advise you on a more specific financial path for your specific needs. For more helpful tips, visit our Resources page. If you do not see the sidebar on the left, with links to our Resources page and other pages, visit our main page at www.BackstageTeeShirts.com to see everything we offer, including resources and contact information, and you an always click the logo at the top of every page to bring you back to the main page.